Jan Toase questioned whether the sitter depicted was the artist Jessie MacGregor (1847–1919), who was awarded a gold medal at the Royal Academy. As the portrait was painted in 1913, according to The Stirling Smith Art Gallery & Museum, the sitter would be aged 66 at the time which, as Betty Elzea outlined, seems unrealistic in view of the sitter’s youthful appearance. 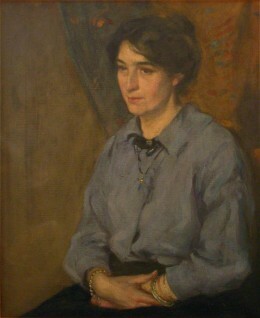 The Museum indicated that the sitter was in fact born in 1879, making her a much more convincing 34 years old at the time the portrait was created. To help contextualise the painting, Kieran Owens added some biographical information on the artist John Munnoch. This sparked other contributors to research the artist more deeply. Information from the Stirling Local History Society proved interesting: Andrea Kollmann discovered that the Jessie MacGregor depicted was Munnoch’s fiancée and not the artist with the same name. The article Kollmann came across also suggested that Munnoch’s fiancée appears in another painting in the collection, giving further evidence to support this conclusion. For clarification, Kieran Owens then suggested that the birth and death dates of the Jessie MacGregor depicted (1879–1951) should be added to the title to avoid further confusion. As a result, The Stirling Smith Art Gallery & Museum has agreed to change the title of the painting and the sitter’s dates have been added to the title on Art UK. Therefore, the discussion successfully concluded that the portrait in fact depicts Jessie MacGregor (1879–1951) rather than the artist Jessie MacGregor (1847–1919). Is this a portrait of the artist Jessie MacGregor (1847–1919)?